The iron's faceplate, more technically known as its soleplate, comes into contact mostly with clean cloth surfaces. Still, the soleplate occasionally gets sticky, usually due to regular starch use that builds up on the plate after repeat applications. Stray adhesive may also be the culprit if you use your iron for construction or crafting projects, such as projects that require heat-bonded veneer or hem tape. 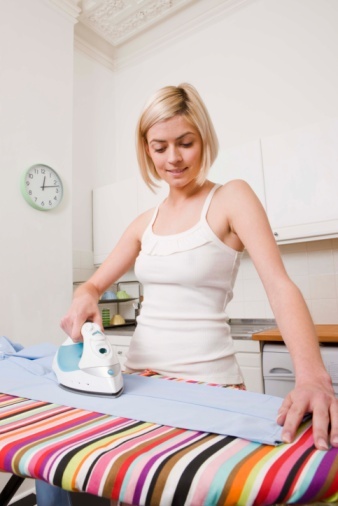 Clean the sticky residue off your iron's soleplate to avoid transferring the gunk onto your clothes or other surfaces. Remove built-up stickiness on your iron's soleplate. Heat a water-filled teakettle on the stove. Remove the kettle from the heat as it begins to whistle. Place two tea bags into your bowl, and pour a cup of water from the kettle into the bowl. Allow the heated water to brew the tea leaves in the bag; this process takes several minutes. Cool the water by adding a cupful of ice. Soak your napkin in the cooled black tea for five minutes. Remove the napkin from the liquid. Wipe the soleplate of your iron against the tea-soaked napkin. Dry the plate with a clean rag. Moisten your old toothbrush. Mix up a thick paste of about 1 tbsp. each of water and baking soda, and dip your brush's bristles in the paste. Scrub the soleplate of your iron with the toothbrush's paste-covered bristles. Use vigorous pressure. If you're not making obvious progress, stop and allow the paste to stand for a few minutes. Moisten your toothbrush's bristles again before returning to scrubbing the soleplate. Wipe away the baking soda residue with a clean, damp rag. Combine 1/3 cup vinegar and 1 tsp. baking soda into a clean container with a pour spout around its rim. The mixture will momentarily crackle or fizz. Open your iron's reservoir and slowly pour the mixture into the reservoir. Set the iron onto its soleplate against a cooling rack. Press the steam button on your iron and allow it to expel the vinegar steam for about 30 minutes. Pour out the remaining vinegar mixture and refill the reservoir with water. Use your iron on a scrap section of cloth to catch any still-exiting gunk.